Photo of Primoz Roglic by Jumbo-Visma. 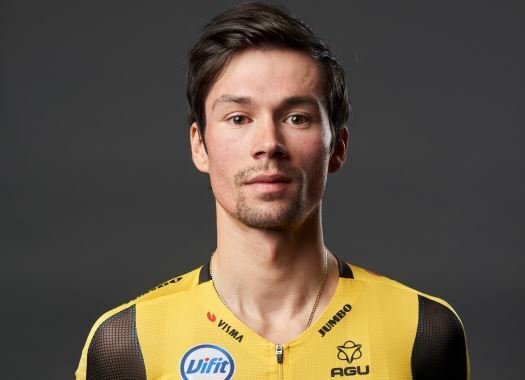 Jumbo-Visma's Primoz Roglic has taken his second overall victory of the season at Tirreno-Adriatico. The rider climbed to the top of the overall classification at the last stage of the race. Roglic managed to beat Adam Yates in the General Classification by a second, taking an exciting last-minute victory of the race. "I cannot describe and express my feelings," said the rider at the end of the day. "This is incredibly beautiful. It was very exciting and the difference is very small. It was really close. But sometimes you have to be lucky. "I gave everything I had. There was a lot of headwind and I tried to make the difference in the second part. That worked out. I have to thank the whole team. This would have never been possible without my teammates. They were all very strong. I am proud of what we have shown again as a team this week. It was a very tough week and we rode really fast in every stage. This is a huge boost for me and the team in the run-up to the goals that are yet to come. In particular the Giro." Jos van Emden was thrilled by the victory of his teammate but was disappointed by not winning the stage. "This time trial was my main goal this spring," the Dutchman explained. "I did not feel that my time trial was good enough for the win, but feelings can deceive sometimes. "In the end, it was not a bad time trial. I proved that I am among the best in this discipline. I really want to have this time trial on my palmarès, so I'm going to try again next season."